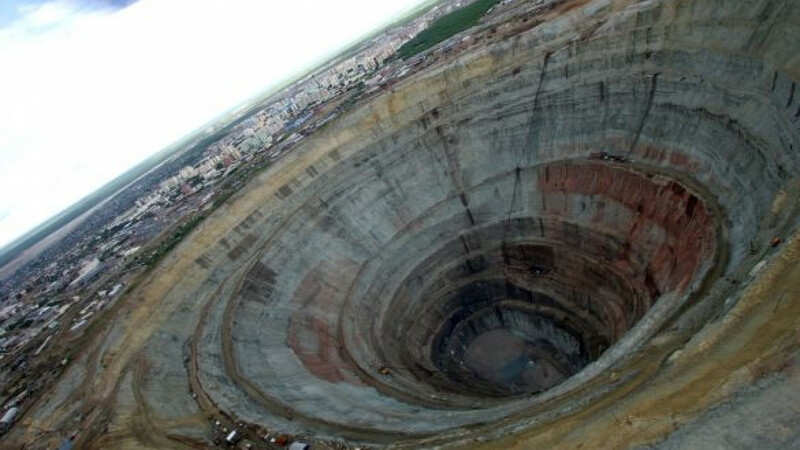 The Mir volcanic pipe mine in the Sakha republic is a key source of raw diamonds that augments Alrosa’s market value. Russia is pushing ahead with plans to sell stakes in diamond miner Alrosa and port operator Novorossiisk Commercial Sea Port as part of a privatization drive, the State Property Agency said Wednesday. In 2010, Russia announced plans to raise $50 billion in five years by reducing its stakes in big companies such as Rosneft, Sberbank and VTB. It plans to sell a stake in Alrosa via a share sale and is looking at either a stock placement or a sale to a strategic investor for Novorossiisk, said Olga Dergunova, head of the agency, which is part of the Economic Development Ministry. "We will propose both options to the government, a stock exchange placement as well as a sale to a strategic partner," she said at a briefing. The agency plans to sell 20 percent of Novorossiisk by the end of this year but not in the spring, she said. Dergunova's comments followed a deal this week between state oil pipeline operator Transneft and trading house Summa, which have joint control over the Black Sea port operator and had fallen out over strategy. Russia and the Sakha republic, a shareholder in Alrosa, aim to raise at least $1 billion by selling a 14 percent stake in the diamond miner, she said. "One billion dollars is the minimum," Dergunova said. The Russian government holds 50.9 percent of the company, which competes with De Beers for the title of world's biggest diamond miner. The Sakha republic holds 32 percent, and municipalities in the region own another 8 percent. As part of the privatization plan, the government previously said it planned to sell a stake in shipping group Sovkomflot and a 5 percent share of Russian Railways in 2013. Privatization of Russian Railways this year is impossible, Dergunova was cited by Prime as saying. But it also quoted Economic Development Minister Andrei Belousov as saying a deal could be done. Analysts say that Russian Railways, a sprawling conglomerate that employs more than a million people, would be difficult to float and that it would make more sense to press ahead with sales of its operating units. Russia is also planning to sell down a 75.5 percent stake in bank VTB. President Vladimir Putin has insisted that public share offerings of Russian state firms be done on the Moscow Exchange, narrowing the options for share offerings and ruling out the deeper markets of London, New York or Hong Kong. VTB is exploring the sale of a $3 billion strategic stake to the sovereign wealth fund of Qatar, sources said Tuesday. Sources also said there are wide differences on price at this stage.